Since the completion of the Icons A to Z series last year, you may have missed my twice-monthly updates. I know that I’ve missed bringing them to you. Since my plans for Icons this year don’t really lend themselves to a regular series of small releases, I figured I’d take the opportunity to update you with what’s going on. First, as you hopefully know by now, the collected edition of A to Z is available online as a PDF ($10) or a print-on-demand softcover or hardcover book, which includes the PDF in the purchase price. Likewise, the Great Power sourcebook has been revised for compatibility with the Assembled Edition of Icons. All purchasers of that sourcebook received the PDF update for free, and backers of the Great Power Kickstarter got a coupon for a discount on the updated print version of the book. Like A to Z, Great Power is now available as a PDF ($10) or a print-on-demand softcover or hardcover book, which gets you the PDF as a free add-on. All three books make for a handsome set! 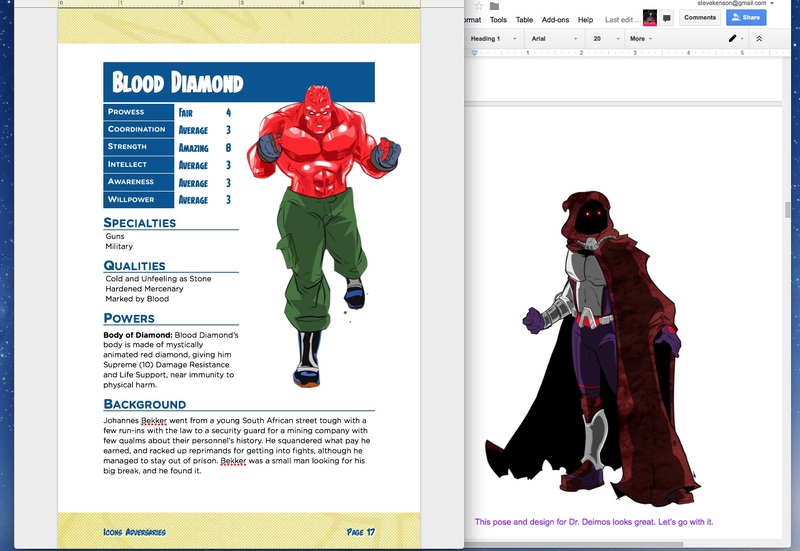 Currently in the works is the Adversaries sourcebook, a collection of villains for Icons, some characters you have seen in the old Villainomicon sourcebook, updated for the Assembled Edition, others, like Blood Diamond and Dr. Deimos here, are entirely new. Icons line artist Dan Houser is hard at work on new illustrations for both many of the original characters along with the new ones and he’s coming up with some great stuff. I’m eager to share all of it with you, and am looking to have the whole collection available for sale by summer. Adversaries should make a nice (A to Z sized) fourth book to round out the current set. Beyond that we have Reign of Chaos, the final chapter in Dan’s epic Rise of the Phalanx adventure series. Once that is out in electronic format, I’ll be looking to collect the entire series of adventures into a single product, offering it in both PDF and POD formats. 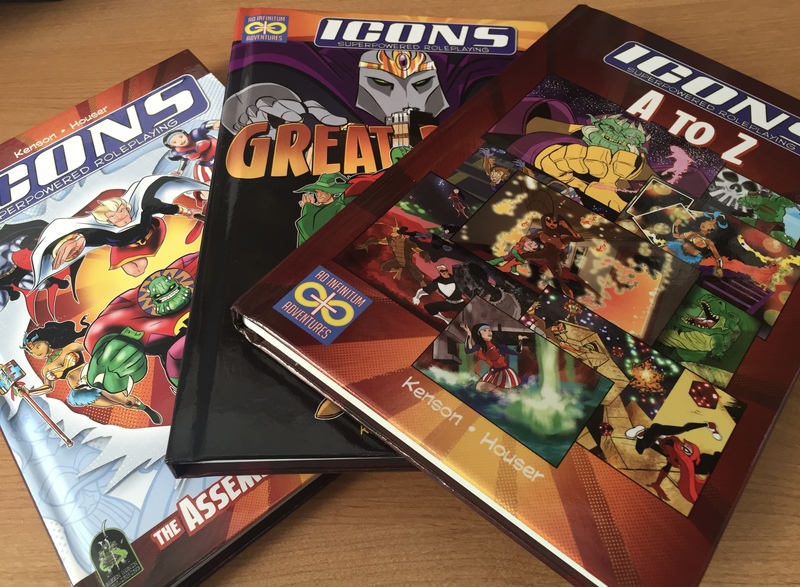 If it does well, there may be other print-on-demand adventure collections, and any re-release of Icons adventures from prior to Urban Jungle will make sure to update everything to Assembled Edition style and format. I’ll see if I can’t offer a few additional updates and previews as work on Adversaries progresses. Until then, keep the world safe from evil, heroes! This entry was posted in Publishing and tagged ad infinitum, adversaries, icons. Bookmark the permalink. Will there be a subscription release schedule like Icons A to Z? There won’t be a subscription for Adversaries, since I’m planning to release the whole book of bad guys at once when it’s done. I’m sorry to hear that, Gerald, and hope you do convert them anyway. It’s kind of hard to come up with a name for a book of supervillains that hasn’t had some variation used at some point, and I never particularly liked the title “Villainomicon”.